The Rivendell Spring Fundraiser will be held on Saturday, March 9th, and will be a Casino Night themed event at the new Elizabeth Hotel in downtown Fort Collins. Mark your calendar now, so you don't miss out on the fun! We will have our annual Rivendell Talent Show on Thursday, December 20th, parents are welcome. Students are dismissed at 11:30 that day, and Winter Break will be December 21st through January 4th. 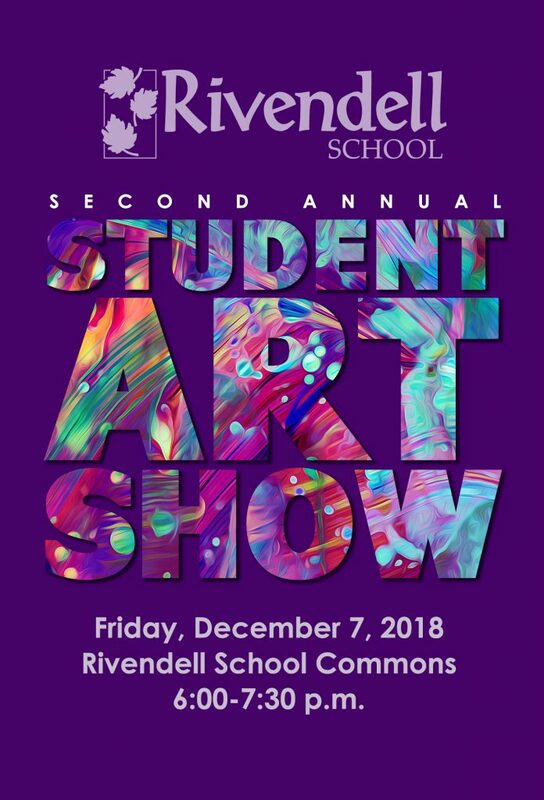 Our 2nd Annual Rivendell Student Art Show is Friday, December 7th 6:00-7:30 p.m. Rivendell families and friends are welcome to stop by a take a tour of our "galleries" that will be set up in the commons and classrooms. All Rivendell students will have art pieces on display, so be sure and stop by to see what your child has created! Hope to see you there! All money collected from Fun Run donations should be turned in by October 12th. If you turn in your packet by the deadline, you will be entered to a drawing to win 6 tickets to The Fort Collins Discovery Center! Your support will enhance literacy materials in our classrooms and is greatly appreciated. Come enjoy delicious food and socialize with friends and family, all the while supporting our school! Old Chicago (off Harmony and Timberline Road) has invited Rivendell families and friends to their restaurant on Thursday, September 20th from 5:30 to 7:30 pm. They generously offered to donate 10% of each ticket to Rivendell School. Middles Kids teachers, Anna and Bryce, and Brenda, our Spanish/Literacy teacher, will be hosting the event! Feel free to bring friends and families from outside of Rivendell - The more the merrier! Mark your calendar for these important Back to School Events! Tuesday - August 21st, 2:00-3:30 p.m. - Back to School Open House for students and parent to visit their new classrooms and meet their teacher. Wednesday - August 22nd - First day of school! Thursday, August 30th, 5:30-7:00 p.m. - Rivendell Family Picnic and Food Truck Event. Bring a picnic dinner, or purchase from the food trucks and socialize with new and old friends! Wednesday, September 5th, 6:00-8:00 p.m. - Parents Back to School Night - Come and learn from your child's teachers, what to expect for the upcoming school year. Watch the newsletter for exact times for your child's grade level presentation. Check out our Facebook page for the latest photos and news from our Summer Enrichment Camps! Order Your 2017-2018 Rivendell Yearbook! Save the Date for Havana Nights! The Annual Spring Event is coming up on March 30th. The event will help raise funds to improve the security and safety of our school and parking lot area. Your support is greatly appreciated. Mark your calendars! Tickets go on sale March 1st. As we prepare for the event, we are seeking businesses and community partners to help sponsor our cause. If you are interested, or have family or friends interested in sponsorship opportunities, please visit this link. Becoming a sponsor is a great way to promote your business in the community! 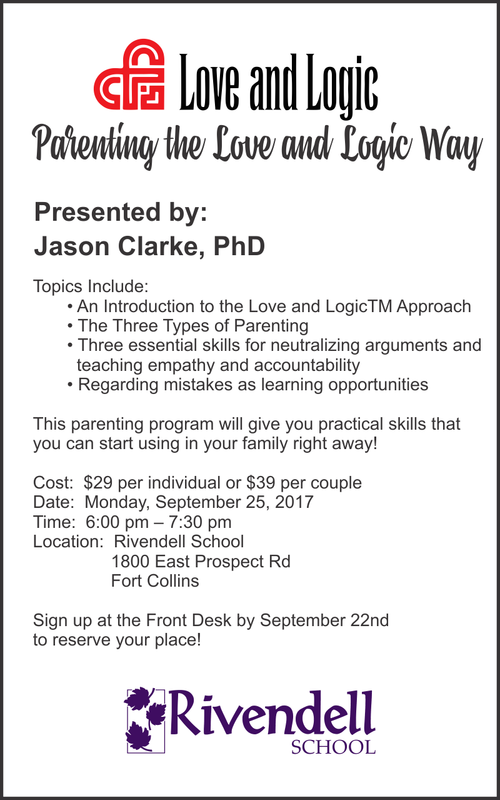 "Becoming a Love and Logic Parent" is an extended three-session program consisting of ninety minute interactive discussions with Dr. Jason Clarke and the other participants in the course about practical tips, strategies, and problem-solving based on the parenting philosophy of Love and Logic. The cost of the 3 sessions held on January 10th, February 7th and March 7th from 5:30 to 7:30 pm is $98 for an individual or a couple. Includes the "Parenting the Love and Logic Way" workbook which contains strategies, essential skills, and exercises for putting Love and Logic to work in the home. Participants in the classes will develop strategies during each session and then have the opportunity to evaluate and problem-solve at subsequent sessions. To register, please see Elisa at the front desk. Purchase your Rivendell Care Packages now! Rivendell Families: Surprise your College/Grad Students/Young Professionals with a fabulous Rivendell Care Package! You can purchase a $40 per care package, or to donate to this cause. Click here for more information. Each Rivendell care package will be filled with coffee, herbal tea, hot chocolate, crackers, popcorn, fruit, chocolate kisses, Ramen noodles, homemade cookies, and an assortment of other goodies. Each care package will come with a note from Rivendell Principal, Holly Warren. These care packages from Rivendell are the perfect pick me up for Rivendell alumni or any college or high school student to help them get through finals week! You're also invited to join us on November 29th to put together college care packages. If you are interested in joining us to prepare the packages, please let Elisa know. Fun Fest is Friday, October 27th! Fun Run pledges are due Friday, October 13th! Please be sure to turn in your Fun Run forms and funds by Friday, October 13th. When you turn in your pledge form, you automatically are added to a drawing to win an inflatable minion, 4 tickets to the Denver Zoo, or 4 tickets to the Denver Museum of Nature and Science! As reminder you can direct your sponsors to our webpage to fulfill pledges. Thank you for all your support! 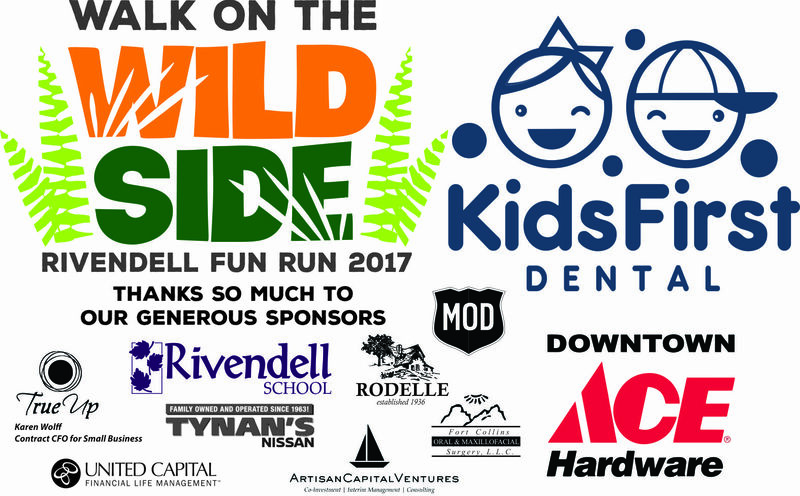 Time to get your Fun Run sponsors! Specials teachers will have tables in the commons to meet parents and provide information on their classes. All families are welcome to attend the school-wide Open House on Tuesday, August 22 from 2-4 p.m. It's an exciting time for students to find their new classroom and get to know their teachers so they can start the new year feeling comfortable and confident. Hope to see you there! We look forward to welcoming all of our families back on the first day of school, Wednesday, August 23! The daily schedule and academic year calendar can be found here on our website.